Men are spending a lot more time on grooming nowadays, in fact when my boys were in their late teens they spent longer in the bathroom getting ready to go out than I did. Friday is Men's National Grooming Day and thanks to the lovely folk at Braun I have a fabulous competition to win a Braun Body Grooming Kit for the man in your life. 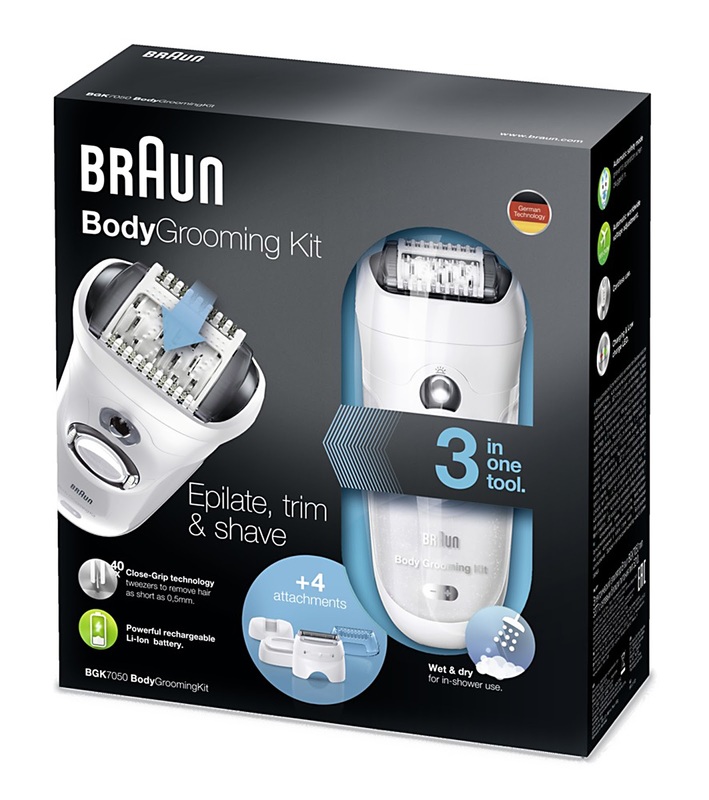 The Braun Body Grooming Kit provides the ultimate flexibility to manscape all areas: epilating removes body hair from the root for up to 4 weeks of results. The Braun Body Grooming Kit provides the ultimate flexibility to manscape all areas: epilating removes body hair from the root for up to 4 weeks of results. The Kit costs around £129.99. This would make the perfect present for any gentleman who likes to keep his body hair in trim so if you would like to enter please complete the rafflecopter form below. For my fiance, the electrical item he couldn't live without would be his PS4. It's his escape and we love playing video games together. My wife could not survive a day without hair straighteners. I am single but my dad couldn't live without his electric powered golf trolley! Oh his phone! He is more addicted than me! His beard trimmer. He likes to keep it nice and short but not clean shave it. his pressure washer! he loves it!! A kettle. Unless it was replaced with a coffee maker! My wife I would say couldn't live without her hair dryer! My hubby couldn't live without his phone, it's glued to him. I would say his Gilette Beard Trimmer! The kettle,he loves his cups of coffee. She can't live without a phone as she spends so much time on it talking to her sisters mainly - a chat seems to be over an hour !!!! His ear & nose trimmer! I think that would be the kettle because he loves a cup of tea! i would have to say his laptop. It would definitely be his phone..permanently glued to his ear! He couldn't live without his iphone! His ps4, its like his baby. There are so many to choose from, but I think I'll go with his phone. TV and sky sports to watch cricket! His electric toothbrush. Fanatical about keeping good teeth he whinges when we take manuals on holiday. Mine couldn't live without any of his tools. He is always modifying his car or bike, I don't think he could a day without having to use them to do something. TV, as he does like to know football score etc. My partner couldn't live without his iPhone. It is practically superglued yo his hand! His drill - don't ask. I think he loves it more than me!! His mobile phone, but also he is obsessed with his new fitbit so maybe that! Her iPad. She seems to be chemically bonded to that thing. His iPhone! He's constantly glued to it. It has to be his tablet i never see him without it.he cant even go to the loo without it! iPhone. Would be like losing a limb! His kettle as he can't live without his coffee during the day. Her phone.She`s just discovered the sky fantasy football app.What a nightmare! it has to be the kettle here too! The "man" of the house, my son, couldn't live without his Kindle Fire. His Garmin for his bike! His PS4 -but I could!!!! It would have to be his laptop, he takes it everywhere lol. I'm lost without my pc. I need a tablet to use when the electric goes off. It would have to be his clippers! He shaves his head everyday! Think it would have to be his coffee maker. That's easy - his gaming rig PC and super fast fibre optic broadband! his phone i swear is glued to his hand ! His tablet. He's never off it. I would say his mobile phone. It`s in arm`s reach most of the time. Second is his satnav. My wife couldn't live without the television as it would mean missing EastEnders. I'm sure mine would pass out if anything happened to his laptop. Without doubt, his gaming pc! Mine couldn't live without his laptop, loves it! His stereo - he loves his vinyl. His TV - I think he'd cry if they were parted! His phone. Which he sadly has lost today and gutted as it has all our daughter's photos. My partner couldn't live without his laptop. I don't think he could live without his electric drill! Hubby couldn't live without his hair clippers, he hates his haor getting too long. His Ipad. He reads his newspapers on it and watches his TV programmes. His gaming set up and the kettle. Oh it's definitely got to be the television! He couldn't live without his phone. Would have to be his computer.